The Evil DM: This is how I roll! : Do you smell what the Roc-- Hercules is cooking?? "Fourteen hundred years ago, a tormented soul walked the earth that was neither man nor god. Hercules was the powerful son of the god king Zeus, for this he received nothing but suffering his entire life. After twelve arduous labors and the loss of his family, this dark, world-weary soul turned his back on the gods finding his only solace in bloody battle. Over the years he warmed to the company of six similar souls, their only bond being their love of fighting and presence of death. These men and woman never question where they go to fight or why or whom, just how much they will be paid. Now the King of Thrace has hired these mercenaries to train his men to become the greatest army of all time. It is time for this bunch of lost souls to finally have their eyes opened to how far they have fallen when they must train an army to become as ruthless and blood thirsty as their reputation has become." 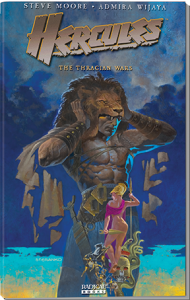 ".. titles focus on retellings of iconic fictional characters, mythology, science fiction, fantasy, horror, historical fiction, supernatural themes, and genre-based crime.."
Thracian Wars, was their first 5 issue mini-series they launched with a great reception for this company. What more can be said, except this movie looks like it could be awesome. The Rock Dwayne is a very entertaining actor as of late, and I have enjoyed most of the movies he has been in, so I will give this one a fair shake. What about you, are you planning on seeing this movie? I will certainly give it a look once it hits DVD but I cannot imagine paying theater prices to watch it.